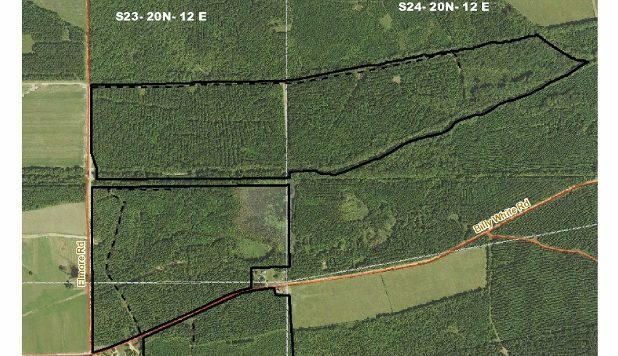 The Clay 310 tract is an outstanding opportunity to own a tract with great timber stands, highly productive soils, excellent hunting, and is close to numerous wood using mills. It is also just a few miles from Mississippi State University, which is the state's largest university. Clay 310 contains approximately 303.1 total acres of which about 266 acres support timber. The tract is located in southwest Clay County approximately three miles west of the Phebe community, five miles northeast of Maben, and 13 miles northwest of Starkville (see Location Map). The tract has approximately 0.75 miles of gravel road frontage on Elmore Road and 0.8 miles of paved frontage on Billy White Road. Internal access is good with several woods roads throughout the property. Clay 310 is located about one mile northeast of Webster 160, which is also for sale. Overall, the timber on Clay 310 is in excellent condition and is growing on good quality sites. An abandoned railroad right-of-way runs east-west through the northern third of the tract. However, The owner is not believed to own the land under the right-of-way. Topography on the tract is nearly level. Total elevation change is about 30 feet and ranges from 280 to 310 feet above sea level. A small creek and a large drainage canal flow easterly through the middle of the tract. A drainage canal (Sun Creek) also forms the entire north boundary as well as the entire perimeter of the northeast panhandle of the tract. Several small ponds are also found on the property. A large 15-acre beaver pond is located on the east side of the property. (see Topographic Map). The property is easily accessed as it has over 1.5 miles of road frontage. The lat/long of the southwest corner of the tract at the intersection of Billy White Road and Elmore Road is 33.574052, -89.009987 The gate at the northwest corner of the tract has a combo lock 4006.